So you just started getting interested in ice fishing. Now you need the most basic piece of equipment: The Ice Fishing Rod. Walmart…all of them are places to buy an ice fishing rod. Well, quite frankly you don’t need one. Nope. You could just buy some ice fishing line and drop your hook and bait down the hole and wait for dinner to grab that bait. This really does work! In fact, in a pinch this is just fine. When you learn about tip-ups, you will note there is no rod at all, you pull the line up by hand. I suppose you are beyond that idea and will splurge for at least $10 for an ice fishing rod? I would, and have done so. Well, here you are staring at 60 different brands of ice fishing rod and reel combos. Everything from brands like Berkley, Frabill, Abu Garcia, HT Enterprises, etc. to the unbranded rod combos that the store buys to sell as their own brand under the minimum advertised price of the EXACT-SAME-WELL-KNOWN-BRAND-NAME rod combo! OK, maybe not exactly, that might be pushing it. The color may be different. The rod guides may not be attached exactly the same, and the reel may break after 3 seasons of use, but we’re talking ice fishing, aren’t we? How often are you going out on the ice? 4 times this year? 10 times? So there you are standing in front of that $50.00 (maybe $100.00 or more?) brand name ice fishing rod and reel combo. But back to my point. 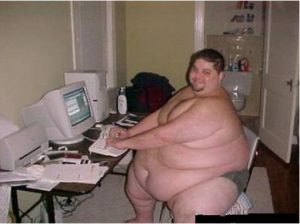 So there you are, salivating over that $50.00 rod and reel combo, then you realize you need two of those babies. Ouch. Now we’re staring at a Benjamin (A $100.00 bill).) And you haven’t even spent a dime on ice fishing line OR tackle! Suddenly, that store brand name combo, at $20 starts looking quite reasonable. And that is my point. While the brand name combos are certainly well made, you ARE paying for the brand name. I’m not done yet! Put your checkbook or Visa away! Around mid-season, those stores start discounting their own store brands. They know they can’t carry their inventory over the summer, so down goes the price faster than a 3 ounce lead weight in 15 feet of water. Remember, the big brands usually have a “minimum advertised price” for their stuff, so while they might knock down the $50.00 combo ten bucks to $40.00 or so, that $20.00 store brand combo is half-price. Yes. Read that again: HALF PRICE. 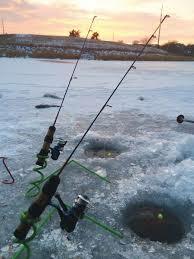 Suddenly you can get a decent ice fishing combo (rod and reel) for around $10.00. TEN BUCKS! This brings me to another point. Every time I’ve been out ice fishing, I find one presentation works, but another doesn’t. If you are fishing alone, I suppose this isn’t an issue, but let’s say that the buddy next to you starts catching fish after fish on his bait/lure. Wouldn’t it be nice to just grab the identical lure/bait combo from your bag of 6 different rods? Yes SIX. They were all set up ahead of time. Maybe 8…maybe 10 of them? All rigged differently…for whatever the bite is. The last thing you want to do is spend 5 minutes retying your line with a different lure/bait, and miss out on the fast action. Because, normally, the action doesn’t last long. 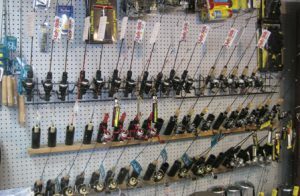 I realize that earlier in this article I suggested avoiding spending $100 on rod combo’s, but you don’t need to do this the first year. Get used to what works, then next year pick up a couple more combos…and so on. Maybe you DO want to spend $100 on rod combos, then fine…grab 10 of the discounted store brand rods and reels and have fun! 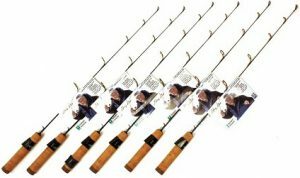 These (online) stores make their money online by selling the brand name rods. Sure shipping might be ‘free’, but you are STILL paying more for that brand name rod than a store brand you can get at less than half that price when you walk into their store. 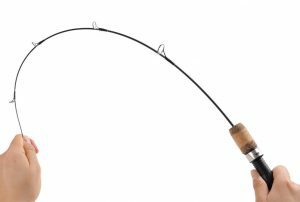 The shipping costs alone would prohibit them from selling (online) their store brand rods at that mid-season discount price. No profit in that. I’m telling you…get off your office chair and scope out the store brand name rods at mid-season in the store and save money. I can also tell you this: I always end up breaking the rod tip of one of my rods each year. It just happens. Perhaps you need to put the one rod away fast to get packed up because of a storm, or a hot bite 50 yards away…it doesn’t matter. Those rod tips are fragile and if you break the $50.00 rod tip…you are going to be stewing about it for the next several hours. And just TRY to explain to your wife how that ‘extra-special-brand-name-super-special-expensive-rod-tip’ got broken and you need another one? Good luck with that! A $10.00 rod that gets broken isn’t the end of the world. Your wife/girlfriend will adore your frugality. Flowers also help. What type of rod should I look for? While you can catch fish on any rod and reel, the most important thing is to decide if you are going to fish with a bobber (sometimes called a ‘dead stick’), or are you going to jig for your fish? If you are fishing with a bobber, then the rod really doesn’t matter. It should have large smooth guides that won’t get fouled up with ice from your ice fishing line. I often use a rod with a broken tip when I bobber fish because…well…what ELSE are you going to do with that rod? Just clip the tip off to the next nearest guide on the end with a fingernail clipper, and you are good to go. If you are going to want to jig, well, then you might want to have a very sensitive tip on your rod with smaller guides. This way you can feel the ‘tick’ when the fish tastes the bait. All in all, you can spend a lot of money on rods, but that rod is only one end (the caboose) of the train that starts at the bottom of the lake or river, about 3″ off the bottom.